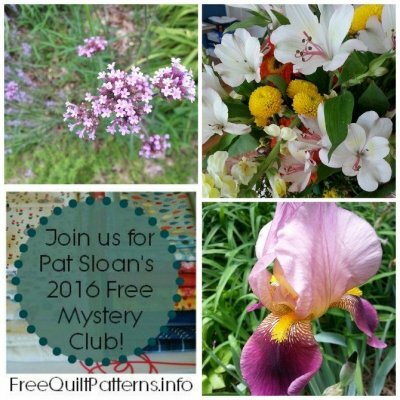 Hi I’m Designer, Author, Radio host Pat Sloan, thank you for joining me for this year for my Mystery Quilt hosted by FreeQuiltPatterns.info! This is my third year hosting the online mystery and we have a lot of quilters from around the world sewing with us. The sharing goes on in my Facebook Classroom ‘Quilt With Pat Sloan’ where I have over 50,000 quilters, and I add hundreds of people each week. My mystery this year is called “My Secret Garden”. Be sure to watch the video below! • This is a 10 month Mystery Block of the Month (BOM) where you will make a 68” x 86” Quilt. • There are 12 blocks to make in the 10 months, plus the final setting. • Every month I'll share something about a Garden. It might be a famous garden, or certain flowers, or ...mmm.. you'll have to check in each month to find out! • A new block is released around the first of each month from January to October to 2016. In November we rally to finish the top! 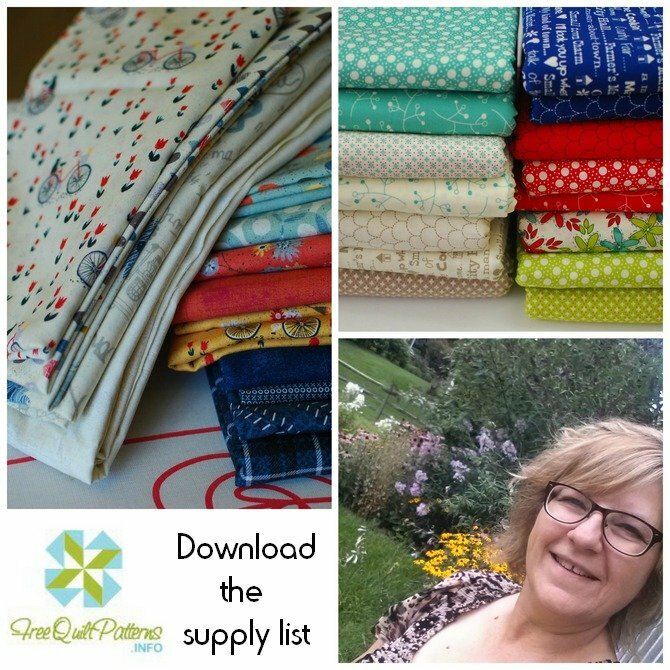 • For each Video in 2016 I'll share a tip or trick for better quilt making to help you improve your skills! If there is something in particular you really want to learn about, leave me a comment below. • Colorway 1- Moda’s line “Mon Ami”, some Moda Grunge and a few Pieces of “Varsity” in Navy. • Colorway 2 - with my Moda Line “Hometown Girl”. My new fabric can be pre-ordered at many shops and it is due to stores in Feb 2016. 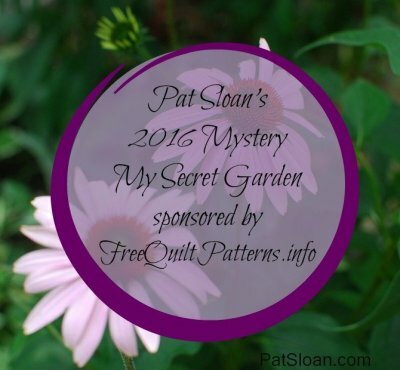 Click Here to download the PDF of Pat's materials list for her Secret Garden Mystery Quilt! NOTE: If the document doesn't display properly for you, there may be a problem with your browser's PDF viewer. From the viewer window, there is a download button that will let you save the PDF to your computer, where you will be able to view and print it just fine. We are currently building a list of participating shops where you will be able to purchase the fabrics for the BOM, this list will be growing quickly, so please check back if you don't see a shop in your area! Click here for the current list. If you are a shop owner and you plan to carry the fabrics for the 2016 Secret Garden Mystery BOM and you also plan to run the BOM as a class or with a club, please click here to sign up (Shopowners only, please!). Visit Pat's Mystery Link for additional posts about the BOM all year long! Are you ready to sew with me in 2016?? leave me a comment below, tell me what you do on vacation! !